Nokia Asha 501 is a great reboot of an already widely popular lineup. The no-nonsense Asha phones have built a reputation for offering great features at an amazingly cheap price, but until now it really lacked in the "fun to use" department. 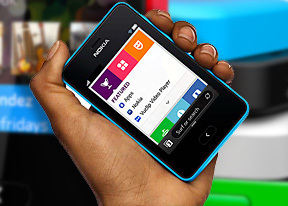 The great news is that changed as Nokia introduced the completely revamped UI called Nokia Asha software platform 1.0. It's not only fresh, but it's also the closest an Asha has even been to a touchscreen and while the budget nature of the whole lineup means developers are never likely to fall in love with it, at its core the platform is not far from a basic droid or WP7.8 smartphone. So, what does that mean for the Nokia Asha 501 and its prospects? Priced at just under €100 for the single-SIM version, the handset faces very few natural rivals, so offering this kind of solid performance makes it quite a hot prospect. Add another €10 and you get a second SIM slot join the Wi-Fi connectivity, FM radio, 3MP camera, and the cool design on the list of assets. It's doesn't sound like a bad trade, but let's see if you can do better. The Nokia Asha 311 offers a snappy 1GHz processor with 128MB RAM, bigger WQVGA display protected with a Gorilla Glass, and better 3MP camera with VGA recording on about the same price as the Asha 501. It runs on the older version of the Asha UI, though, and it isn't nearly as solidly built, so we'd say you are better off spending the extra €10 and getting the Asha 501 on this occasion. There are a couple of Android smartphones from this year batch that successfully compete with the Asha 501 price tag - the LG Optimus L3 II and the Samsung Galaxy Star S5280. They both offer dual-SIM versions and QVGA screens (3" for the Samsung handset and 3.2" for the LG smartphone) to go with the Android 4.1.2 Jelly Bean. However, since these are bottom of the barrel droids, the performance is far from perfect - lags and holdups are a rather frequent sight and even if Project Butter tries to mask much of it the CPUs inside simply can't keep up with the platform requirements. If you are of the patient kind, however, you will get far greater versatility with the two droids than you would from an Asha 501. Even excluding those that are too heavy for the limited chipset, the Optimus L3 II and Galaxy Star S5280 have access to tens of times more apps than the Nokia handset. Then, there's Nokia's own Lumia 610 from the company's last year batch. Powered by the WP7.8 platform, the Lumia 610 is the clear winner when it comes to hardware - a Scorpion CPU and a 3.7" display of WVGA resolution really dwarf what the other contestants here have to offer. There's also more storage, 3G with HSDPA and the free lifetime navigation thanks to Nokia Drive. There's no dual-SIM version here, though. In the end of the day Nokia Asha 501 brings a number of features on a bargain price, which combined with its fresh look and solid build quality is bound to attract a large number of customers on a tight budget. At this point though, it's flying way too close to smartphone territory to be comfortable - it's up to Nokia to fix that with a price cut and set things right.